Whether it is a user-friendly Content Management System (CMS), a lighting fast Static Site or a dynamic Web Application I can help. Have a look at some of the Web Development frameworks, plugins & integrations I have experience with. The most widely used self-hosted platform. Perfect for blogs, e-commerce & easy maintenance. I also provide WordPress Management Services. A Headless CMS built on to the popular Hugo & Jekyll static site generators. A JAMstack based CMS that integrates with Git for user-friendly editing & easy version control. A popular framework for responsive websites. Mobile friendly, fast & lightweight. Mobile responsive Material Design UI Kit built for Bootstrap. 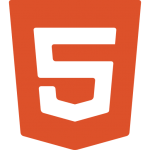 A style-sheet language used to describe the layout and design of HTML documents. Open-source Admin Template based around the Bootstrap 4 framework. An open-source, progressive JS framework for building user interfaces. A programming language used to create dynamic sites. Works alongside HTML & CSS to create more complex designs. A markup language used for presenting content, the most recent version of one of the cornerstone web technologies. Popular ecommerce platform encompassing an online store builder, payments gateway & in-store point-of-sale system. A payment processor that provides the banking infrastructure for many online stores, marketplaces & subscription sites. Billing software for subscription & recurring payments with advanced dunning features & compatible with most major payment gateways. Extensible open-source WordPress plugin powering over 30% of the world’s online stores. An online payment processor that handles 25 currencies in over 200 countries for individuals & businesses. WordPress plugin used for event management, attendee check-in, RSVP & ticket sales. A development platform offering real-time databases, user authentication, asset hosting, CDN & cloud storage for website applications. API library that provides secure access to many Google products including Gmail, Maps, Docs, Adsense & many more. A “conversational marketing platform” that helps convert your website visitors into sales leads in real-time.